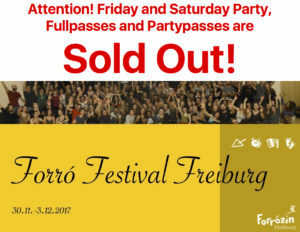 Friday and Saturday parties are sold out! Sunday night – tickets for Diego Oliveira available at the door! We have recently found out that the dancing area at the party location will be smaller than expected due to delayed repair work. Over the past several months the landlords have assured us several times that all works would be finished on time, which is unfortunately not the case. Despite our disappointment we are determined to make a great festival! The holders of Full Passes and Party Passes are guaranteed to enjoy the party. However, we cannot sell any more tickets for Friday and Saturday nights for security reasons! Since we expect lower attendance on Sunday we will sell tickets at the door (for the concert of Diego Oliveira). The pre-parties on Wednesday (with Forró na Hora Band) and Thursday (with DJ Atila) are open for everybody as well. We are sorry for the inconvenience. We would love to welcome you next year. 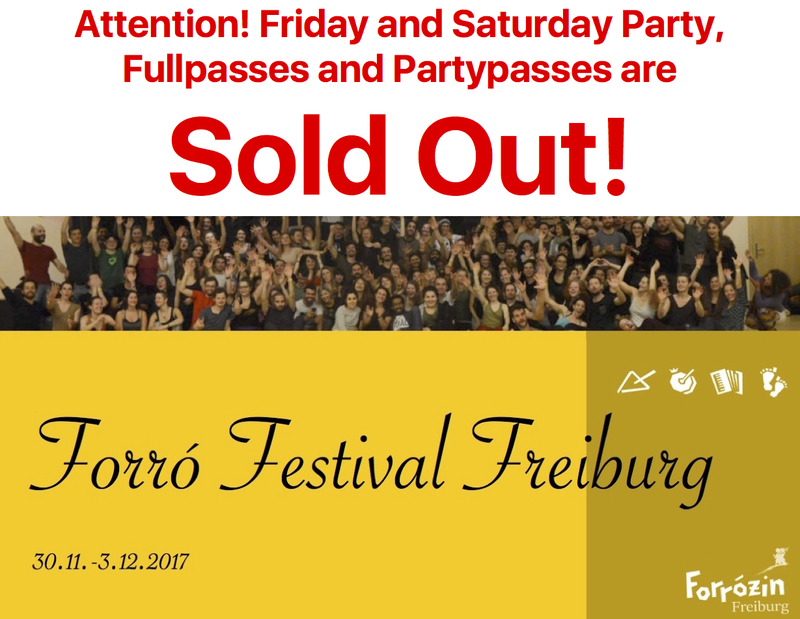 Please get in touch with info@forrozinfreiburg.de and send your booking confirmations to us. We will try to find a solution for you.